But in this increasingly jingoistic climate there is a growing number of citizens who dare to call for a peaceful solution. Nimisha Jaiswal reports. After travelling to Pakistan for a conference for young parliamentarians, Divya Spandana, a former Indian legislator, was charged with sedition. Her ‘crime’ was to publicly praise the hospitality of Pakistanis, and say that the country was ‘not hell’. The charge comes in a year that has been particularly tense for India and Pakistan. With terror attacks on Indian army camps and months of protests in the contested region of Kashmir, war rhetoric has soared between the neighbouring countries – both of which possess nuclear weapons. 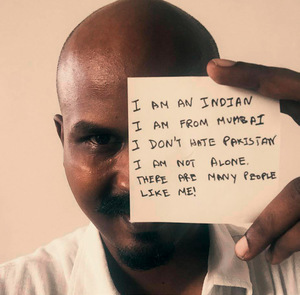 ‘Social media is so important, and we need to use it to build thousands of bridges,’ says Rehan Allahwala, from Karachi, Pakistan, who volunteers for #ProfileforPeace setting up peace groups. ‘I have created Whatsapp groups to create dialogue with Indians, and I encourage citizens of both countries to have at least 50 Facebook friends across the border,’ he says. Take-up is slow, but Allahwala draws hope from anonymous messages of support in a society where people are fearful of repercussions if they speak out for peace. View from India: Will cows and temples still deliver a mandate for Modi? View from India: Why are Indian men feeling unsafe?